2. Combine flours and salt in a stand mixer using a paddle or by hand in a large bowl. 3. When yeast solution begins to foam, pour it into the flour along with the oil. If you have an electric mixer use a dough hook to mix until all ingredients come together, and then continue kneading for 5 minutes. You can also combine the ingredients by hand. Mix for a couple minutes using a heavy spoon. Dough will be very loose at this stage but as the dough rests the whole wheat flour will slowly absorb moisture and the dough will thicken. Place the dough into a covered bowl in your refrigerator for 1 to 2 days. 4. Make the sauce by combining the crushed tomatoes with tomato puree in a blender. Blend on medium speed for 30 seconds. Combine tomato sauce with other sauce ingredients in a small saucepan over medium heat. When the mixture begins to bubble reduce heat to low and simmer, covered, for 30 minutes, stirring occasionally. Remove from heat and cool, then chill in a covered container until you make your pizza. 5. When you are ready to make pizza, preheat a convection oven to 450 degrees (or conventional oven to 475 degrees). 6. Form the dough into a ball on a well-floured surface. Sprinkle cornmeal on a clean flat surface and begin to stretch out the dough using your hands or roll it out with a rolling pin until it will fit on a 14-inch pizza screen (or in a pizza pan). Lay the dough onto the screen, and stretch it to form a perfect circle to the edge of the screen. 7. Spoon a thin layer of sauce over the pizza dough leaving about a 1-inch margin at the edge. You will use about half of the sauce. 8. Sprinkle the shredded cheese evenly over the sauce. Don’t worry if some falls onto the edge of the dough. 9. 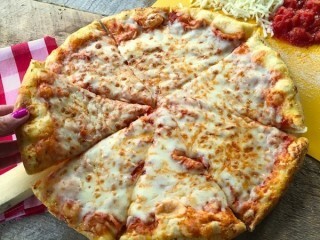 Bake pizza for 7 to 9 minutes or until cheese and crust begins to brown. 10. While the pizza bakes, make the garlic spread by combining ingredients in a small bowl. Use your fingers to crush the dried parsley into smaller bits before stirring it in. 11. When the pizza is done, remove it from the oven and brush just the crust with garlic oil spread. Use a pizza wheel to cut pizza into 8 slices.